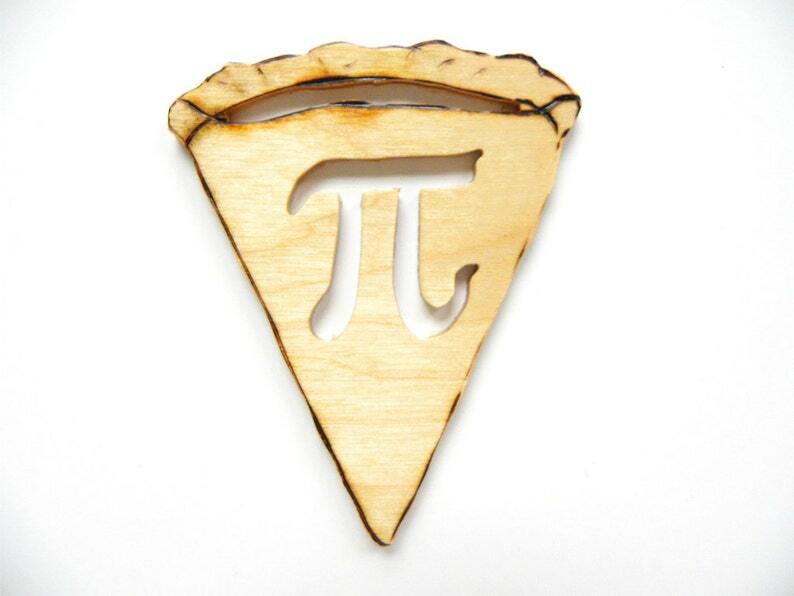 What a great way to celebrate the love of math – a slice of Pi. Perfect gift for mathematicians, engineers, scientists or teachers. Getting married on Pi Day? Perfect wedding favors or table decoration. These are more than just plain cut outs - after hand guided scrolling, pyrography was used on the “crust” and along the edges of the Pi "slice" to add visual interest. This woodcraft is one of a kind and ready to ship. The photos may not be of the actual art work you will receive; however, they are extremely close. Each piece is handcrafted which results in one-of-a-kind variations. Pi day is March 14th. The photos may not be of the actual item you will receive; however, they are extremely close. Handmade with pride in New Jersey, USA. Bought this to use as a photo booth prop at our Pi Day wedding. It’s a lot smaller than I thought, but it’ll do. Might be a good idea for the shop to put a photo up of it being used as a pin on a person so customers can realize the sizing and proportions better. Cute pin, you can definitely see the work that went into making this so beautiful. Received when promised. Looks awesome. Thanks! Wonderful looking piece of artwork. Love it!